Tis the season, folks, and the presents are already rolling in. 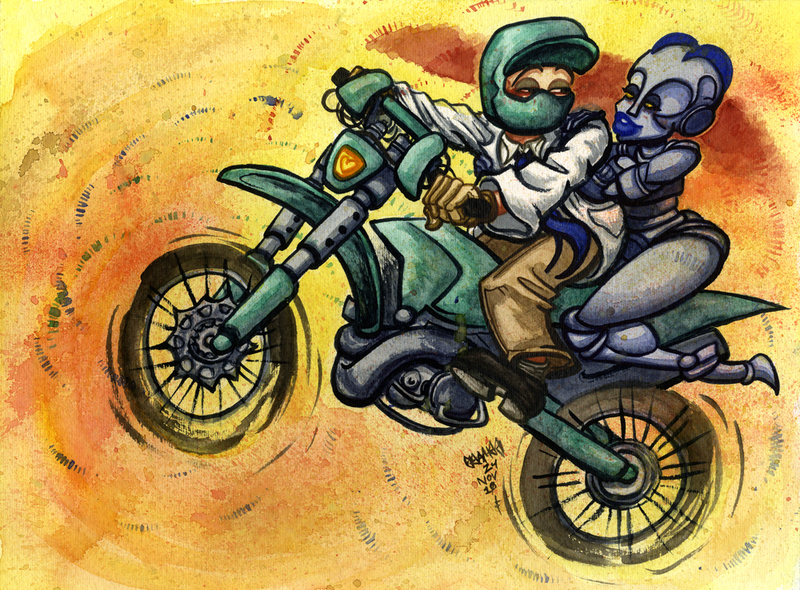 Why, just this weekend, we unwrapped this little tribute to Man/Robot love by Action Age family member JoJo Seames. Then be sure to get back here this Thursday, when our very own Matt Digges takes things by the reins to deliver what we’re gonna go ahead and promise will be the best thing you ever get from anybody. So watch out! Don’t pout! It’s an Awesome Hospital Christmas! Woah! That is one amazing piece of art. I assume it is hand painted and not digital art? Yes, you assume rightly. This piece is 100% watercolor, on 140lb cold-pressed watercolor paper. It’s my very favorite medium to work in. As the image was loading, I could only see the very very top of Doc Dirtbike’s helmet, and assumed this was a picture of Luigi. Does anyone else see this? Silliness aside this is wonderful art – it’s got a great, trashy, almost Frazetta-esque vibe. Just kidding. I saw it too.